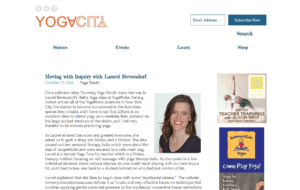 On a cold and rainy Thursday, Yoga Sleuth made her way to Laurel Beversdorf’s Hatha Yoga class at YogaWorks. Having visited almost all of the YogaWorks locations in New York City, I’ve started to become accustomed to the luxurious spaces they inhabit, and I have to say that 2:30pm is an excellent time to attend yoga on a weekday. Rain pattered on the large arched windows of the studio, and I felt very thankful to be indoors practicing yoga. As Laurel entered the room and greeted everyone, she asked us to grab a strap, two blocks, and a blanket. She also passed out her personal therapy balls, which were about the size of racquetballs and were encased in a cute mesh bag. Laurel is a trained Yoga Tune Up teacher which is a fitness therapy method focusing on self-massage with yoga therapy balls. As she spoke to a few individual students about various injuries, no one could resist playing with our new toys a bit, and I had to toss one back to a student behind me who had lost control of his.